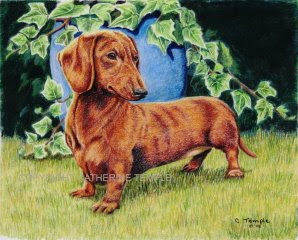 Just off the easel this past week is this little dachshund that I've simply titled "Doxie and Ivy." I have a dog show coming up this weekend in Enumclaw, Wa. and I decided I needed a few new pieces so I created this. It is done in colored pencil and I decided to try a few different techniques with creating a dark background. After applying several layers of color I dipped a brush in some turpentine and used it to dissolve and blend the colors. Then I added some other color over that to even it all out. I usually don't get too carried away with backgrounds in my portraits as I really just like to focus on the animal, but every once in awhile it's good to stretch and try something new. Keeps me from getting bored! This piece is for sale. It's an 8 x 10 painting, matted and framed for $300.00. If you are interested in giving it a good home you can email me at kindredspirits@clearwire.net. Thanks for looking! I'm off to organize and pack for the show!